K94 Rocks FM, We play the best classic and new rock along with Cincinnati Reds baseball, Cleveland Browns football, Columbus Blue Jackets hockey, & plenty of high school sports action. 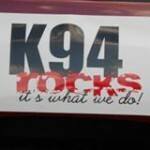 Listen to Mon-Fri to Terry & Julie 6a-10a, Julie 10a-12p, & Jerrdog 1p-6p. And don’t forget the Saturday Morning Show with Jeff & The Riot 6a-9a!! Musically, rock has centered on the electric guitar, usually as part of a rock group with electric bass guitar and drums. Typically, rock is song-based music usually with a 4/4 time signature using a verse-chorus form, but the genre has become extremely diverse.